Hi, I am Neil Price of Bark Busters Home Dog Training Macclesfield & Manchester South. I am your local dog behaviour therapist. 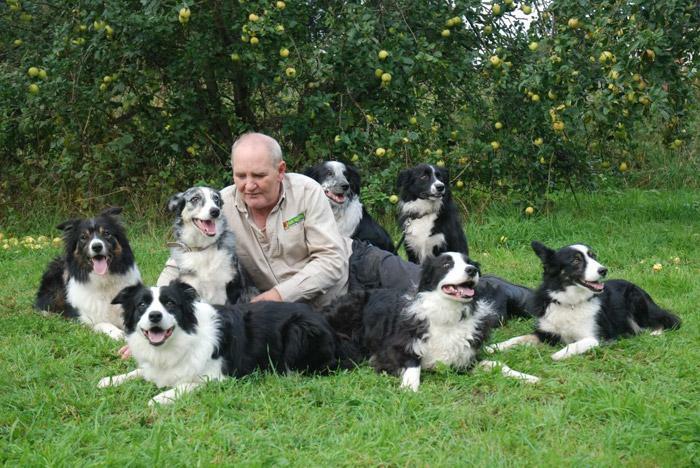 I grew up on a farm, so my first experience of dogs was with my parents working farm dogs. Working sheepdogs, were the breed that helped us work the sheep and from my earliest memory I was out with them walking and watching how they cleverly responded to my dad’s handling skills, herding and penning the sheep expertly saving time and energy of the humans! That’s where my love and respect for this breed started, although they are not always the easiest of dogs! As well as the Border Collie working dogs, we always had a Jack Russel house dog, Pip, an inquisitive, lively boy, often had to be retrieved from visitors’ cars before they drove off! I always hoped to work with animals, but as my parents retired from the farm, I realised that I wouldn’t be able to work it on my own, so moved on to a more conventional working life. I worked in horticulture, travelling to Holland quite a lot, but still managed to have dogs in my life! Two gorgeous German Shepherds, Winston and Blaise, who were looked after by family whilst I was away, were wonderful dogs, and were easy to train and a joy to live with. Although this helped a lot, I still wanted to have a full-time career with dogs and a friend mentioned Bark Busters. When I explored further, I realised that this was my ideal career and I now support dogs and their owners in the Macclesfield & Manchester South areas using kind, calm methods and working one-to-one with dog owners in their own homes. My residential training was intense, but soon I began to make major progress with young Gemma. The other dogs, (all rescues) had found me and I could not resist them. They varied in age, with their own challenges, but Gemma was special. She was very nervous, displaying signs of aggression to both dogs and people. She was not house-trained and not in the best physical shape. In the first weeks she showed real signs of aggression. Her initial behaviour was very challenging, but with patience and Bark Busters communication techniques, Gemma and I had a great relationship. Before she retired, she and I competed at a national level in Kennel Club agility competitions and I was so proud of her when she gained the highest KC award of Agility Warrant Gold. My love of agility has given me enormous fun, hard work and great friends, and as I am also a KC Agility judge, my life is always surrounded by dogs. I also give my time, free of charge once a week, to Cheshire Dogs Home, working with any dog that needs help to find a new home. The issues can be anything from teaching a dog to walk calmly on loose lead, to addressing nervous aggression or even OCD. It is so rewarding seeing them and their new adopters start a happy life together. So, if you are not enjoying your family pet fully, if you’re getting frustrated or challenged by their naughty behaviour or if you just need some guidance for general obedience training or have a new puppy, I can help you. Sometimes it seems that you love them, you walk them, you feed them, yet nothing seems to be working. Unwanted behaviour problems such as aggression, chewing, jumping up, chasing, pulling on the lead, selective hearing, recall and many more behaviour traits are not uncommon. It can be upsetting to see your pets showing signs of being nervous or fearful. If you are experiencing such problems and hope to resolve them, you have come to the right person. I will teach you how to communicate effectively with your dog using techniques that they will quickly and instinctively understand. My methods are kind and calm and I will ensure you have mastered the training so that you can continue to improve the behaviour to the level you would like once I leave. In addition, you'll have peace of mind that if you need further help, this is provided free of charge under our Bark Busters Written Support Guarantee. I work with any breed, any age and any issue, so I look forward to helping you rebuild that bond with your dog, so you can enjoy and be proud of them.